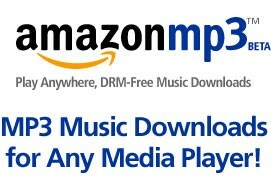 Today Amazon.com launched AmazonMP3 which features over 2 million songs from more than 180,000 Artists and over 20,000 labels, including music from major labels EMI Music and the Universal Music Group. These songs are in the MP3 format and are DRM-free so you can play them on any digital audio player available. Purchases are made a la carte and use Amazon's One-click shopping making it quick and easy to download. Their prices are 89 cents for bestselling MP3s making it a little cheaper than iTunes and the files are encoded at 256kbs making them twice the audio quality of iTunes downloads. You can make purchase for individual tracks or as an entire album which provides a discount (basically the same as iTunes except Amazon seems to be cheaper). We purchased an album and it was a smooth process. You need to download their application called the Amazon MP3 Downloader which downloads the files and then puts them right into iTunes or Windows Media Player. Amazon has confirmed that some labels are applying watermarking, but are only inserting into the file that it was purchased from Amazon, and not any personal customer information. 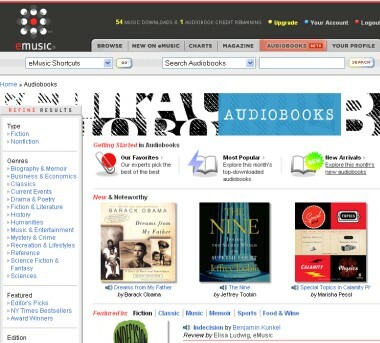 Amazon.com hasn't started selling DRM-free MP3 audio book downloads yet, but it is pretty certain they will do so soon.